Monash University Library ; Clayton, Vic. The exhibition was held in the Rare Books Exhibition space, Sir Louis Matheson Library, Monash University from 7 October 1998 - 26 February 1999. Ideally, a theatre exhibition should go well beyond the texts of plays themselves. 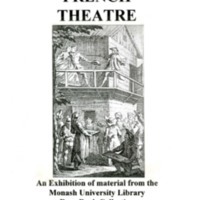 The buildings in which performances took place, the sort of staging provided, the reactions of spectators, the careers of famous actors - these are all essential in providing the context of the French theatrical tradition. This sample of what the Rare Books Collection has to offer may give you a taste of French theatre.